I think I can help with is the appearance of Yes in SF during the Fragile tour. They did appear with Black Sabbath but it occured on March 10, 1972. I happen to collect tapes by both groups so I can give a reason or two as to why this didn't happen on 11/10/71. I have had both the Sabbath and Yes sets on tape for years as 3/10/72, the Yes set is clearly an early '72 performance, demonstrated by many things not least of all Squire's long bass solo on The Fish, which he doesn't play that way in late '71 from any tape I have. Sabbath performed "Tomorrow''s Dream, which was never performed before 1972, the tape indeed does open with Bill Graham's warning about the presence of police. Both bands perform in absolutely brilliant fashion! What a show! Incredible show. 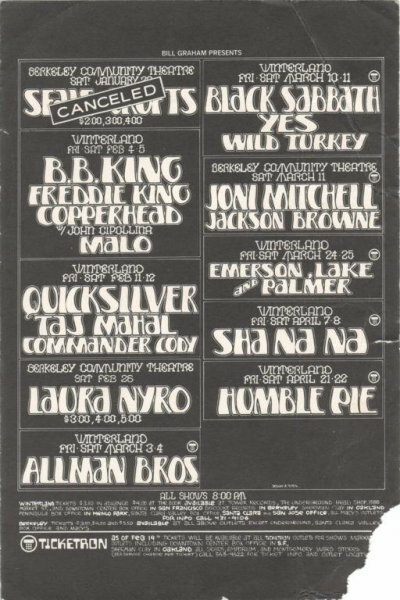 Yes was the second band and Black Sabbath headlined, the opening act was a band called Wild Turkey. Yes opened for Black Sabbath; talk about two completely opposite styles! I had gone to see Black Sabbath that night and was moved by this band called Yes from whom I'd only heard Roundabout. They were good. The Squire and Wakeman capes were a new feature to me, and the music was excellent. I'd never heard Heart of the Sunrise but was captivated by it. Conversely, Black Sabbath was totally lame; Ozzie Osbourne continually leapt about the stage giving peace signs and then singing terribly and their drummer couldn't keep a tempo. Jon Anderson announced during that night that their equiptment had been stolen at some point before the show and that they were playing on rented equiptment. It was offered as an excuse (as I recall) as to why they didn't sound as good as they might have. I've never heard anything more about this incident and have often wondered if anyone else has. Thank you, thank you very much for listening, thank you. We realize this is an audience from San Francisco and..uh..we're going to do a song for 'The Yes Album' which is our third album. I'd like to introduce to you Steven. He going to play some things for you on acoustic guitars. [???] Okay, that's cool, very cool. This is 'Mood For A Day'. We're going to do a song from..um..our fourth album, which is called 'Fragile' and..uh..it song that sorta relates to [???]. Pleased about that. The song is called 'Heart Of The Sunrise'. Thanks very much, thank you. Thank you. Like to..uh..introduce you to..our resident keyboard player and..uh..just this week became the father of a nine pound eleven ounce little boy. Mr Rick Wakeman. I'd like to thank you very very much for listening and..uh..we're going [???] tommorrow night [???] 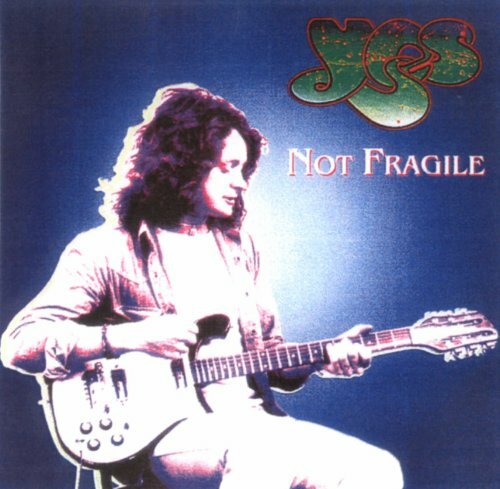 would like to do a song from 'The Yes Album'. It's a song related to the forces of nature, yes the forces of man and..uh..[???]. The song called 'Perpetual Change'. Thank you for listening, good night, enjoy yourselves. [???] It's called 'Yours Is No Disgrace'.